This article is about the Local Government Area. For the kingdom of the same name, see Nembe Kingdom. For the language, see Nembe language. Nembe is a Local Government Area of Bayelsa State, Nigeria. Its headquarters are in the town of Nembe in the east of the area at4°32′22″N 6°24′01″E﻿ / ﻿4.53944°N 6.40028°E﻿ / 4.53944; 6.40028. It has an area of 760 km² and a population of 130,931 at the 2006 census. The postal code of the area is 562. Much of the area of the LGA is occupied by the Edumanom National Forest. The city is the base for the Nembe Kingdom, a traditional state. ^ Mogens Herman Hansen (2000). A comparative study of thirty city-state cultures: an investigation. Kgl. Danske Videnskabernes Selskab. p. 534. ISBN 87-7876-177-8. 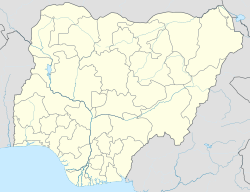 This Bayelsa State, Nigeria location article is a stub. You can help Wikipedia by expanding it.